We are delighted to share a couple of Anniversary strings with you. 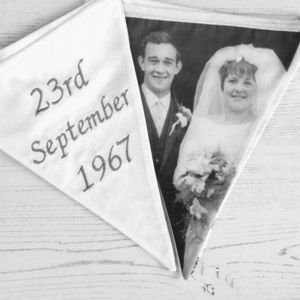 Many couples have celebrated very special anniversaries and shown off their beautiful strings of bunting at their parties. Friends and family have also ordered strings, which make fabulous gifts for that special couple. 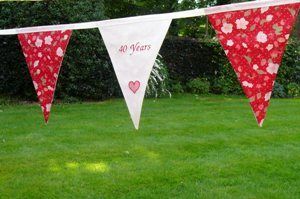 So why not design a beautiful string of bunting for yourself or a friend and make gifting very personal. 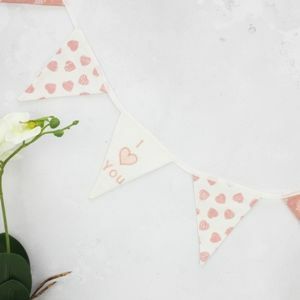 We will guide you through your fabric selection as well as suggesting ideas and your bunting could include embroidery or appliqué, so let your ideas run riot! But do remember there is only so much you can get on one pennant. Once all the selections have been made and payment has been received you would need to allow at least 10 working days (2 weeks) before your bunting would be posted. At busy time this might be longer but we would let you know this in advance. 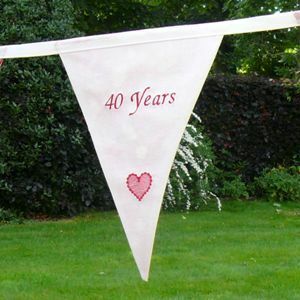 If you would like to order and design that special string of bunting then do get in touch please CLICK HERE You will be asked to fill in your name and email address, in the message box please fill in your requirement's. We will then get back to you with fabrics and colours and cost. 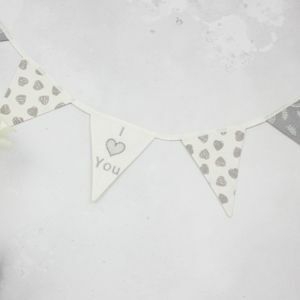 Please Note - Prices vary depending on what you would like & also note that all bunting strings that are made to the customer's specification and clearly personalised cannot be returned or refunded.